Once Our Way - The Delta Discovery, Inc. Here is a photo of one of the scenes from "Once Our Way" during the dedication ceremony of the Tununak Qasgiq. Here is a photo of one of the scenes from “Once Our Way” during the dedication ceremony of the Tununak Qasgiq. The earliest known film about a Yup’ik community made by a Yup’ik filmmaker has been saved and digitally restored. “Once Our Way” was directed, produced, and photographed by Andrew J. Chikoyak of Tununak. Chikoyak passed away in 2012. This film is an incredible documentation of how a community comes together to re-build their village qasgiq, or Men’s House. The footage, which runs approximately 26 minutes, features scenes of life in Tununak – a woman taking down her dried herring, children playing on a fishrack swing, wooden boats, drying fish, a kayak stored upside down on its rack, and Eskimo dancing with feasting. It also shows rare footage of elder Francis Lincoln. 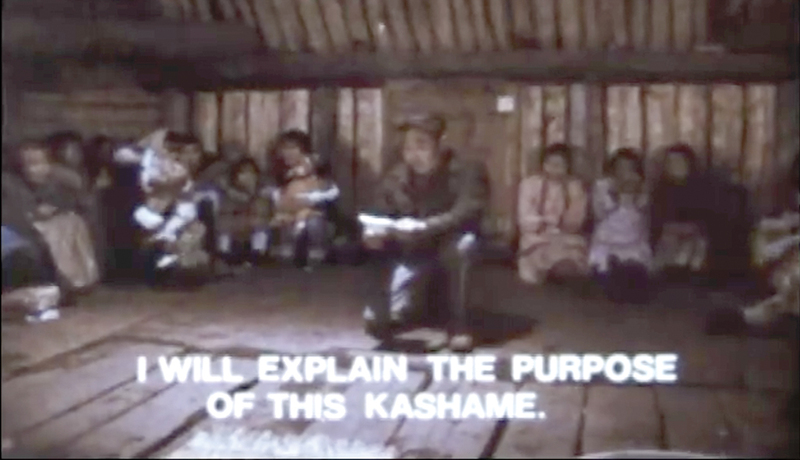 Len Kamerling, who recently presented a Bethel screening of his film about Emmonak shot in 1977 “Uksuum Cauyai – the Drums of Winter” wrote about the importance of the film to a colleague, Timothy Miller. Miller works at the Lower Kuskokwim School District’s media archives. Kamerling emailed Miller about Once Our Way. The opening scene of the footage shows an aerial view of Nelson Island. The windblown cliffs and ocean come into view and then the village. Vintage-style music is added along with the opening credits. Chikoyak was determined to make his own film, and it is because of him that we have this historic account that we can now all enjoy and learn from. There’s wooden boats with motors parked along the ocean shore and it is summer because the taperrnaat grasses are full-grown and tall. Split salmon is hanging on the fish rack and the braided-herring is half-picked. A woman is putting her dried herring in her tut’aq – a large grass totes used to store dried fish. There is a young man – possibly Andrew – wearing horn-rimmed glasses talking with Francis Lincoln who is recalling the days of old. The narration and subtitles are in English. “Reconstruction of the centuries-old kashim is to preserve some of the traditional values for future generations to come,” says the narrator. “The kashim was the center of village activities, the place where men slept, ate and worked. Where the medicine man performed his powers. “The kashim is rapidly vanishing from Eskimo villages. Eskimoes are living in frame houses. Community halls made of lumber are taking the place of the kashim. Once a new way or a new thing is accepted, the old ways become forgotten,” he continued. In the film, the qasgiq was being rebuilt. It had been left alone for 3 years. The rebuilding was all by hand – the sawing, adzing and chopping, making each piece fit. Then they covered it with sod, nevuq. And then it was finished. To celebrate a potlatch dinner feast with a dedication ceremony and traditional dances was held. The ladies sat along the wall in their beautiful flowery patterned cloth and fur parkas. The men wore warm parkas – it looked like it may have been fall or early winter by then. The inside of the qasgiq looked spacious. The footage showed a feast of boiled fish, cooked geese, herring eggs, friend bread, mak’aq (fish egg akutaq), akutaq, and seal oil. The men ate mak with great relish, everything looked so delicious. After the feast the dedication and statement took place. A man knelt in the middle and spoke. “We will fill it with old traditional things, it will be our museum,” he said speaking in Yugtun. He said that their Yup’ik culture will live on through the qasgiq for future generations to learn from. The next scenes depicted Eskimo dancing. There were never more than 5 dancers at a time. There was always one or two men, and one to three women dancing at one time. One of the ladies wore a dance belt – qes’utaq. And they all wore headdresses and qaspeqs. The film ends with a 4 years later summary. “When I explained that we had perhaps the only copy in existence my supervisor saw the importance of the film and approved sending it out for cleaning and digitizing,” said Miller. Quyana for preserving this rare treasure!